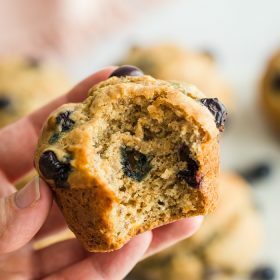 The BEST Vegan Blueberry Muffins- this homemade blueberry muffin recipe is vegan, dairy free, and comes together in just one big bowl! Pre-heat oven to 350 degrees F. Grease a 6 cup muffin tin. Sift together the flour, baking soda, baking powder, salt, and cinnamon. Stir in the milk, nut butter, maple syrup, vanilla extract, and mashed banana. Stir until well combined and then gently fold in the blueberries. Evenly spoon the mixture into the 6 muffin cups and top with a few more blueberries if desired. Bake in oven for 24-28 minutes or until golden brown and a toothpick inserted in comes out clean. Let cool slightly and ENJOY! !